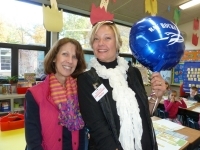 Normandy first-grade teacher Julie McArn and BVEF trustee Jacquie Mayer celebrate in the excitement for Family Math Night. Each year, Bay Village educators have the opportunity to submit requests for instructional support and enrichment materials that intend to have a significant impact in students' learning for years to come throughout the Bay Village School District. The Bay Village Education Foundation annually contributes to these meaningful and thoughtful requests with funds from contributions and fundraisers, awarding these educators the opportunity to strengthen and add innovative ideas into students’ daily learning experiences. The Bay Village Education Foundation lends a helping hand to those teachers and staff that desire a little something extra each year, such as to initiate a revolutionary idea, gather more purposeful and helpful supplies, or to try using new equipment with their students to innovate learning. Those, of course, are just to name a few examples of the possibilities. The BVEF’s mission is to support, promote and fund all areas of public school curriculum and enhance enthusiasm for learning inside and out of the classroom. Each fall, they do just that. The trustees extend the offer to Bay teachers and staff to award grants to fund these exciting ideas that are requested throughout the district. The grants awarded can range from providing support to extra-curricular activities, classroom and district activities, and to a variety of creative learning opportunities in the schools and community. Over the past three years the BVEF has awarded $10,000-12,000 annually to fund various ideas, materials and activities with dollars contributed and fundraised throughout the year. After careful consideration by the BVEF, the much anticipated notification of grants took place around the end of October with the BVEF “Grant Prize Patrol” that visited each awardee to deliver the good news. This year, approximately $11,000 was granted to various teachers to positively affect and impact their students for this year and years to come. At Normandy, “Project Buddy," requested by Megan Basel, and a first-grade afterschool book/reading club were funded. Project Buddy aims to add benches around the school playground to enhance students’ positive interactions and experiences together. The book club aims to promote strong literacy and reading for pleasure for students. A family math night, planned for this winter by Normandy’s first-grade team, was also provided funding to enrich students' academics involving their parents and the community. At Westerly and Normandy, “One School One Book,” the school’s collaborative effort by Normandy principal Dan Sebring, Westerly principal Josie Sanfilippo and the OSOB Committee to ignite excitement for students with reading and partner with community businesses, was funded for the second consecutive year after the program’s outstanding successful pilot year in spring 2014. At Bay Middle School, the Global Arts class was funded for Ann-Marie Young that provides students with sound writing practice and the ability to experience and explore different cultures worldwide. Middle school math teachers Julia Papcke-Russell and Carol Brajdic received funding for “Electricity and Algebra” that aims to help bridge the math and science curriculum together. Seventh and eighth grade special education students received funding for a tool to improve their academic achievement and online skills. These particular students prepared and wrote their own personalized grant for iPad keyboards to help them prepare for the upcoming online testing. For Bay High School, Thomas Schemrich and the art department were awarded funding for a new anatomical reference skeleton to enhance instruction and for reference. The community can support the BVEF in their efforts to provide enrichment and support creativity in all of the Bay Village schools and to teachers in the future by participating in or attending the organization’s multiple events and fundraisers each year. In particular, their upcoming annual fundraising event, “Creating Opportunities” is set for Sunday, Jan. 25, at Arrabiata’s in Bay Village from 5-8 p.m. You can contact the Bay Village Ed. Foundation via email, bayedfoundation@gmail.com or bobpiccirilli@gmail.com for ticket sales and information. This event features a silent auction, raffle, door prizes, dining and a night filled with fun with various members of the community and those surrounding. Visit BayEdFoundation.org for more details.